For lunch today was my only ADR of the trip, Via Napoli. 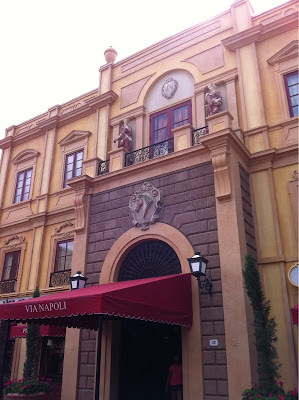 The surroundings are amazing, the cast-members fast and extremely friendly. I took pictures of the interior with my larger camera. I took the ones I am posting here with my iPhone. For lunch I started with a Moretti beer. It is a crisp lager, light amber in color and full of hops. It seemed to fit well with the appetizer I chose--Gamberetti Fagoili. 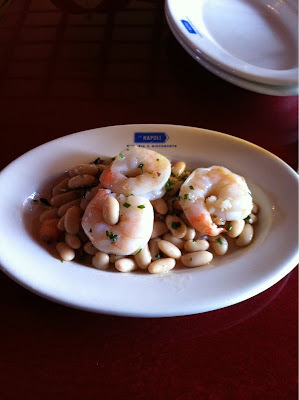 Three large perfectly cooked shrimp on beans with cilantro onion and olive oil. Light and perfect. I don't think I have ever had shrimp cooked so expertly. For the main course I chose the pizza Funghi or mushroom pizza. As I understand all the ingredients are brought in from Italy with the exception of the water, however Disney found a source that is chemically identical to that of Italy. Let me tell you it made a difference, some of the best pie I have eaten. The individual pizza could be shared. I only got just shy of 2/3 of it down before I stopped myself. It is a light, simple down to the basics style of pizza making worth the trip over. That looks delicious! Thanks for sharing! It really makes me sad that we missed our ADR on the last trip. Oh well, something to look forward to for next time! 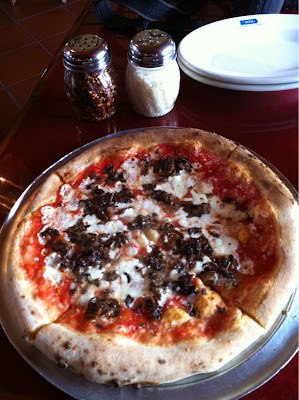 Via Napoli is on our "maybe" list for the next trip. I am hoping we can try it out. It looks delicious! Looks fabulous! I'm definitely going to have to check it out on a future visit. Have fun, Ridge!